Rare borosilicates from Namaqualand, S. Africa: an intergrowth of blue grandidierite and dark spinel, 1mm across, invades pale yellow werdingite. Learning about the fundamental processes of metamorphic change, and in particular how the observed patterns reflect the thermodynamics and kinetics of mineral reactions. Using this knowledge to determine pressure-temperature-time paths for deep-seated metamorphic rocks, with the aim of solving problems in continental tectonics. 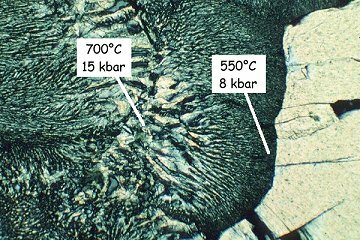 Microscopic observations, therefore, are a key to understanding crustal-scale processes. My research forms an integral part of collaborations with Prof M. P. Searle, Prof L. J. Robb and external co-workers, and involves several graduate students. Our principal tools are the polarising microscope, scanning electron microscope, and the electron probe microanalyser. For more about the activities of the wider research group, visit the Hard Rock Group website. Large thermal aureoles, such as that beneath the mafic rocks of the Bushveld Complex, South Africa, provide an environment of known thermal history for testing the predicted relationships between the rates of heating, nucleation and growth, which are ultimately expressed in metamorphic reaction microstructures and crystal size distributions. A quantitative model has been developed to account for the decrease in observed porphyroblast size with increasing grade and constrain the overstepping required to drive metamorphic reactions. Subtle detail in the microstructure (see illustration) indicates sequences of mineral growth that cannot be matched by equilibrium thermodynamic models, suggesting that barriers to nucleation are sufficient to allow metastable reaction sequences to occur, at least in the static environment of contact metamorphism. Continuing research is exploring other settings in which the microstructural and microchemical record of prograde metamorphism shows significant deviation from the predicted equilibrium behaviour. The metamorphic rocks in the axial zones of mountain belts preserve a record of the behaviour of continental crust during collision. 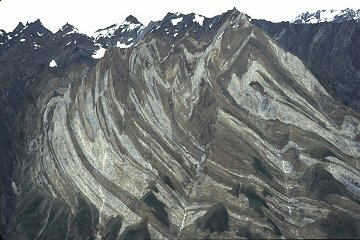 In the NW Zanskar Himalaya, for example, crustal thickening is revealed both in kilometre-scale structures (pictured here is the closure of the Donara nappe) and at the microscopic scale of mineral growth and fabric development. We extract pressure-temperature paths from compositionally-zoned garnets that grew during compressive deformation, using the thermodynamic data set and calculation program THERMOCALC. Here, we find a steady increase in both P and T, rather than the P increase followed by thermal relaxation commonly proposed for idealised collisional orogeny. Similar techniques are being deployed to unravel the extended and complex internal history of the Karakoram Metamorphic Complex in the Hunza and Baltoro regions. We are also working to constrain the amount, timing and rate of exhumation associated with major fault systems (such as the South Tibetan Detachment system) in the Everest area, in Zanskar, and at Nanga Parbat in the NW Himalaya. To circumvent shaky assumptions about thermal gradients during cooling through mineral blocking temperatures, this is being done by direct pressure determinations on peak and retrograde mineral associations, and by numerical modelling of the temperature-depth evolution. We are studying eclogite-facies rocks, formed from continental material of shallow origin, in Norway, Oman, parts of the Himalayan chain, and the Western Alps. Eclogites form at depths in excess of 50 km, deeper than the base of normal continental crust, and special mechanisms must operate to drive buoyant crust down to mantle depths, and to return some of it to the surface. In western Norway, parts of the Western Gneiss Region have experienced pressures > 30 kbar (100 km depth) and contain relics of coesite, the high-density silica polymorph. We have shown that these ultra-high pressure rocks form a distinct unit that can be differentiated from lower-pressure (ca. 20 kbar) eclogites on petrographic and mineral composition criteria as well as on evidence for the former presence of coesite. Mechanisms for the exhumation of Norwegian and Himalayan eclogites can be illuminated by studying the minerals and microstructures formed during decompression. We have studied the compositions of amphiboles and other hydrous minerals that have grown during the exhumation, and record the recycling of aqueous fluids in the subduction zone at 15 - 20 kbar (50 - 70 km depth). The fine-grained mineral intergrowths (symplectites, see photomicrograph) that replace eclogite-facies phases show systematic trends in composition and lamellar spacing, which appear to record a two-stage exhumation history, with initial rapid decompression followed by formation of the intergrowths on a cooling trajectory from about 14 kbar, 700°C. Therefore, the onset of symplectite growth probably marks the transition from buoyancy-driven uplift to a slower, tectonically-driven mechanism at this depth, perhaps controlled by extensional shear zones. The consolidation of new or reworked continental crust involves granulite-facies metamorphism, partial melting, and the emplacement of water-undersaturated magmas. Even in rocks subjected to such high temperatures, a record of the processes remains, either in outcrop-scale textures of migmatitic rocks, or in the small-scale compositional patterns within refractory minerals. The rare-earth phosphate monazite (illustrated) holds particular promise, as the growth zones can in principle be dated as well as correlated with the reaction history of the rock. For example in Namaqualand (South Africa), field relationships, reaction microstructures, calculated mineral equilibria, in-situ monazite dating (provisional) and geochemical mass balance tell us that granulites formed in the middle crust (15 - 20 km depth) at ca. 1060 - 1030 Ma on a path of increasing pressure during heating to 850°C. They lost a small amount of melt, sufficient to remove the water from the breakdown of hydrous minerals, and underwent only limited back-reaction with residual melt at ca. 1020 - 1010 Ma. Palin, R.M., Searle, M.P., Waters, D.J., Horstwood, M.S.A. & Parrish, R.R. (2012). Combined thermobarometry and geochronology of peraluminous metapelites from the Karakoram metamorphic complex, North Pakistan; New insight into the tectonothermal evolution of the Baltoro and Hunza regions. Journal of Metamorphic Geology, 30 (8), 793-820. doi:10.1111/j.1525-1314.2012.00999.x. Alvarez-Valero, A.M., Waters, D.J. (2010). Partially melted crustal xenoliths as a window into sub-volcanic processes: evidence from the Neogene magmatic province of the Betic cordillera, SE Spain. Journal of Petrology, 51, 973-991. doi:10.1093/petrology/egq007. Crowley, J.L., Waters, D.J., Searle, M.P., Bowring, S.A. (2009). Pleistocene melting and rapid exhumation of the Nanga Parbat massif, Pakistan: age and P-T conditions of accessory mineral growth in migmatite and leucogranite. Earth and Planetary Science Letters, 288, 408-420. Chan, G.H.-N., Waters, D.J., Searle, M.P., Aitchison, J.C., Horstwood, M.S.A., Crowley Q., Lo C.-H. and Chan J.S.-L. (2009). Probing the basement of southern Tibet: evidence from crustal xenoliths entrained in a Miocene ultrapotassic dyke. Journal of the Geological Society, London, 166, 45-52. doi:10.1144/0016-76492007-145. Searle, M.P., Noble, S.R., Cottle, J.M., Waters, D.J., Mitchell, A.H.G., Hlaing, T. and Horstwood, M.S.A. (2007). Tectonic evolution of the Mogok metamorphic belt, Burma (Myanmar) constrained by U-Th-Pb dating of metamorphic and magmatic rocks. Tectonics, 26 (3), TC3014. Warren, C.J. and Waters, D.J. (2006). Oxidized eclogites and garnet-blueschists from Oman: P�T path modelling in the NCFMASHO system. Journal of Metamorphic Geology, 24 (9), 783-802. Parrish, R.R., Gough, S.J., Searle, M.P. and Waters, D.J. (2006). Plate velocity exhumation of ultrahigh-pressure eclogites in the Pakistan Himalaya. Geology, 34 (11), 989�992. Warren, C.J., Parrish, R.R., Waters, D.J. and Searle, M.P. (2005). Dating the geologic history of Oman's Semail ophiolite: insights from U-Pb geochronology. Contributions to Mineralogy and Petrology, 150, 403-422. Searle, M.P., Simpson, R.L., Law, R.D., Parrish, R.R. and Waters, D.J. (2003). The structural geometry, metamorphic and magmatic evolution of the Everest massif, High Himalaya of Nepal-South Tibet. Journal of the Geological Society, London, 160, 345-366. Waters, D.J. and Charnley, N.R. (2002). Local equilibrium in polymetamorphic gneiss and the titanium substitution in biotite. American Mineralogist (Holdaway issue), 87, 383-396. Waters, D.J. and Lovegrove, D.P. (2002). Assessing the extent of disequilibrium and overstepping of prograde metamorphic reactions in metapelites from the Bushveld aureole. Journal of Metamorphic Geology, 20, 135-149. Walker, C.B., Searle, M.P. and Waters, D.J. (2001). An integrated tectono-thermal model for the evolution of the High Himalaya in western Zanskar with constraints from thermobarometry and metamorphic modeling. Tectonics, 20, 810-833. Wain, A.L., Waters, D.J. and Austrheim, H. (2001). Metastability of granulites and processes of eclogitisation in the UHP region of Western Norway. Journal of Metamorphic Geology, 19, 609-625. Waters, D.J. (2001). 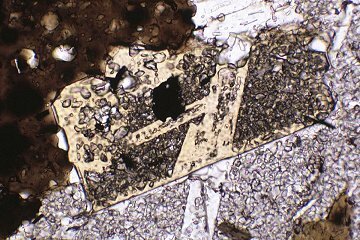 The significance of prograde and retrograde quartz-bearing intergrowth microstructures in partially-melted granulite-facies rocks. In: Kriegsman, L. (ed.) Prograde and retrograde processes in crustal melting, Lithos, 56, 97-110. Stephenson, B.J., Waters, D.J. and Searle, M.P. (2000). Inverted metamorphism and the Main Central Thrust: field relations and thermobarometric constraints from the Kishtwar Window, NW Indian Himalaya. Journal of Metamorphic Geology, 18, 571-590. Wain, A.L., Waters, D.J., Jephcoat, A. and Olijynk, H. (2000). The high-pressure to ultrahigh-pressure eclogite transition in the Western Gneiss Region, Norway. European Journal of Mineralogy, 12 (3), 667-687. Robb, L.J., Armstrong, R.A. and Waters, D.J. (1999). The history of granulite-facies metamorphism and crustal growth from single zircon U-Pb geochronology: Namaqualand, South Africa. Journal of Petrology, 40, 1747-1770. Searle, M.P., Waters, D.J., Martin, H.N. and Rex, D.C. (1994). Structure and metamorphism of blueschist - eclogite-facies rocks from the northeast Oman Mountains. Journal of the Geological Society, London, 151, 555-576. Waters, D.J. and Martin, H.N. (1993). Geobarometry in phengite-bearing eclogites. Terra Abstracts 5, 410-411. Searle, M.P., Waters, D.J., Rex, D.C. and Wilson, R.N. (1992). Pressure, temperature and time constraints on Himalayan metamorphism from eastern Kashmir and western Zanskar. Journal of the Geological Society, London, 149, 753-773. Waters, D.J. (1991). Hercynite-quartz granulites: phase relations, and implications for crustal processes. European Journal of Mineralogy, 3, 367-386. Waters D.J. (1989). Metamorphic evidence for the heating and cooling path of Namaqualand granulites. In "Evolution of Metamorphic Belts", eds. Daly J.S., Cliff R.A. and Yardley B.W.D., Geological Society of London, Special Publication 43, 357-363. Waters D.J. (1988). Partial melting and the formation of granulite facies assemblages in Namaqualand, South Africa. Journal of Metamorphic Geology, 6, 387-404. Waters D.J. (1986). Metamorphic history of sapphirine-bearing and related magnesian gneisses from Namaqualand, South Africa. Journal of Petrology, 27, 541-565. Waters D.J., and Whales C.J. (1984). Dehydration melting and the granulite transition in metapelites from southern Namaqualand, S. Africa. Contributions to Mineralogy and Petrology, 88, 269-275.